It always feels particularly difficult to provide an overview of a young goalkeeper when you consider the occupational hazards of the position. No other player touches the ball less frequently – no other position is judged as decisively on the basis of one single action. Just as one magnificent save can be enough to exaggerate a keeper’s talents, one solitary mistake can be enough to end a career. A young talent always has that rawness factor, that nagging issue of inexperience, and the problem is only exemplified by the difficult criteria of which a goalkeeper must be judged by. The pressure alone associated with goalkeeping is enough reason for clubs to avoid playing young players in goals, coupled with the fact that young players are not necessarily mature enough to start on a regular basis (and, as a rule of thumb, managers prefer to stick with one first-choice keeper). That said, young goalkeeping talents do emerge – rarely younger than 20, 21, but old enough to have trained for a few years at the club and be mentored under the watchful eye of an older goalkeeper and their coach. This was certainly the case with new Club Brugges signing Mathew Ryan. A product of Westfield Sports High – an Australian school famous for producing footballers – he originally started at the Central Coast Mariners in their youth team, and after impressing with a string of composed performances in the youth league, signed a three year contract in 2010. The intention was for him to learn his trade in the senior squad under the tutelage of Jess Vanstrattan, the first choice keeper, and goalkeeping coach John Crawley. 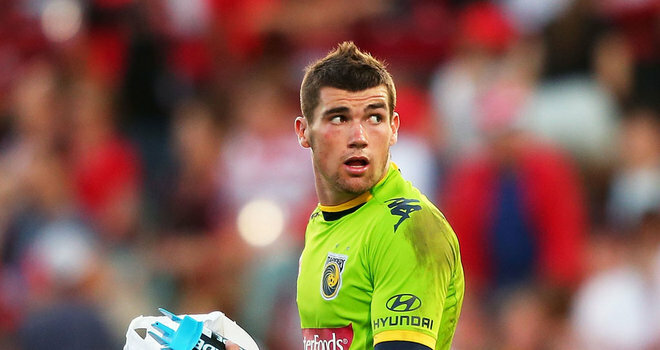 But Vanstrattan snapped his anterior cruciate ligament just three weeks into the season – an injury which would see the experienced goalkeeper ruled out for the season – and so Ryan was given a baptism of fire with a debut against A-League rivals Sydney FC. It did not go to plan. His error lead to Sydney’s opening goal, and despite the Mariners fighting back for a 1-1 draw, many expected head coach Graham Arnold to replace Ryan with Paul Henderson, an experienced 34 year old signed on a short team deal to replace Vanstrattan. But surprisingly, Arnold kept faith in Ryan, and was rewarded with a remarkable season which saw the young keeper keep ten clean sheets in nineteen starts, win the A-League Young Player of the Year Award and a place on the shortlist for the PFA’s A-League Team of the Season. Ryan acknowledged how important it was that Arnold gave him a second chance. ”Arnie could have dropped me after I made a mistake in my first game against Sydney but he stuck with me and that gave me a huge boost,” he reflected in January 2011, eleven days after a second high-profile error in a match against Melbourne Victory on New Year’s Eve 2010 which saw the Victory steal a late win through two goals courtesy of goalkeeping mistakes. Those words of praise were certainly vindicated as Ryan went on to become an integral part of a strong Mariners side, making eighty appearances over three seasons, including two Grand Finals in 2011 and 2013. The first one – coming at the end of his debut season – saw Brisbane Roar score two goals in the final five minutes of extra time to reverse a 2-0 deficit and take the match to penalties, in which Ryan was powerless to stop the Roar momentum – but still going on to win the Joe Marston Medal as Man of the Match. His second season in the senior squad was similarly spectacular, going on to win a consecutive Young Footballer of the Year award, as well as the ‘Golden Glove’ and the Mariners Medal, awarded by the club for the best player of the season. In 2012/13, he enjoyed similar success, and a 2-0 Grand Final win against Western Sydney Wanderers in April this year will be a more memorable moment for Ryan, and a fitting way for him to end his A-League career. He has been on the radar of several European clubs for a few years, having trialed with Tottenham Hotspur and West Bromwich Albion in July 2012, and been linked extensively with a move to Lille, Rangers and Hull amongst others. It is not hard to see why Ryan is so highly sought – he is a tremendous shot stopper, with strong reactions and great athleticism. Ryan is not overtly tall, compared to other keepers, but physically he is in fantastic shape – in fact, there is a Twitter account devoted to his abs. In this age of universality – defenders must also be able to attack, strikers must defend – goalkeepers are expected to be proficient with the ball at their feet, and in this regard, Ryan is outstanding. There is a channel on YouTube devoted to highlights of his distribution, with clips of his side volleys particularly popular. That might seem a little strange for a goalkeeper highlights package, but Ryan’s ability to facilitate quick counter-attacks with accurate drop-kicks has helped his side become even more dangerous on the break. He is also well grounded, revealing an intelligent mindset about his future prospects in an interview with Adelaide Now. “Stereotypically the England goalkeepers are 6’3″, 6’4″ giants – I’m only six foot, not that big. Brugges, then, is ideal for Ryan – a stepping stone for a young goalkeeper with a very promising future.